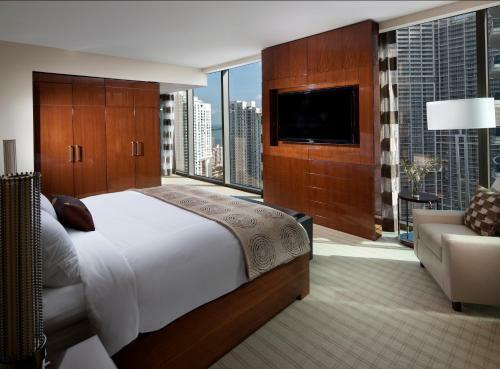 The latest high-tech gadgets a soothing spa and activities ranging from a golf school to a basketball arena to a virtual bowling alley combine to make the non-smoking JW Marriott Marquis Miami hard to resist. Rising 41 floors the shimmering glass facade of the Marriott is a local landmark. Each of the 313 non-smoking rooms and suites has sweeping views and amazing amenities from a 52-inch flat-panel TV (plus another behind the bathroom mirror) to a panel where you can plug in mp3 players to an espresso machine. The decor is distinctly modern with polished woods and luxurious fabrics in shades of cocoa and biscuit. Wired and wireless internet is available. There's a spa with a long list of treatments as well as a fitness room and a heated outdoor pool. Other recreational activities include an indoor golf school an indoor tennis court and an NBA-approved basketball arena. The hotel charges a fee that includes limited access to the billiard room the media theater the golf simulator air hockey table tennis and foosball. One on-site restaurant overlooking the Miami River serves breakfast and two others serve lunch and dinner. If you need more privacy there's also room service. Valet parking is available for a fee. The Port of Miami is just over a mile from the Marriott making it a great spot if you're headed to or coming from a cruise. Even closer are a variety of fine-dining establishments all within an easy stroll of the hotel. Also walking distance is the sprawling Miami Convention Center. South Beach and its see-and-be-seen restaurants and nightclubs is six miles east. Miami International Airport is eight miles west.